A Diamond Select Toys release! When Slimer's thirsty, no bottlecap will stand in his way! 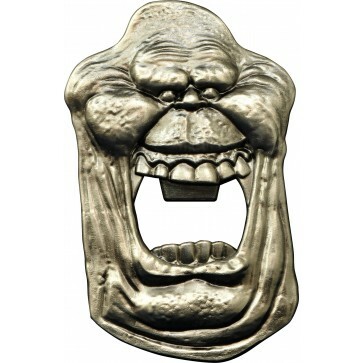 The free-floating phantasm from Ghostbusters is known for his love of food, but he also enjoys a good beverage, and this metal bottle opener will pry a cap off of a bottle faster than you can say "He slimed me!" Plus, magnets on the back will hang Slimer on your refrigerator or containment unit until you need him again! Packaged in a full-color slipcase.